Our lives are not centered on ourselves, they’re centered on Jesus. It’s not about us, it’s about Him. We didn’t initiate anything, He did everything. Our life is a response to what’s already been done. Love compelled Him, and now it compels us. We love people as they are, not as we wish them to be. The call of God is without discrimination, and the love of God is without boundaries. We to go to the broken, we go to the bruised. We leave the 99 to go to the 1. Faith requires risk. Sometimes we have to be willing to risk looking ridiculous to see the miraculous. Our trust is in Jesus, not in what we see, but in what He sees. We’re willing to go, to step out of the boat, to launch out into the deep, relying on the Holy Spirit every step of the way. 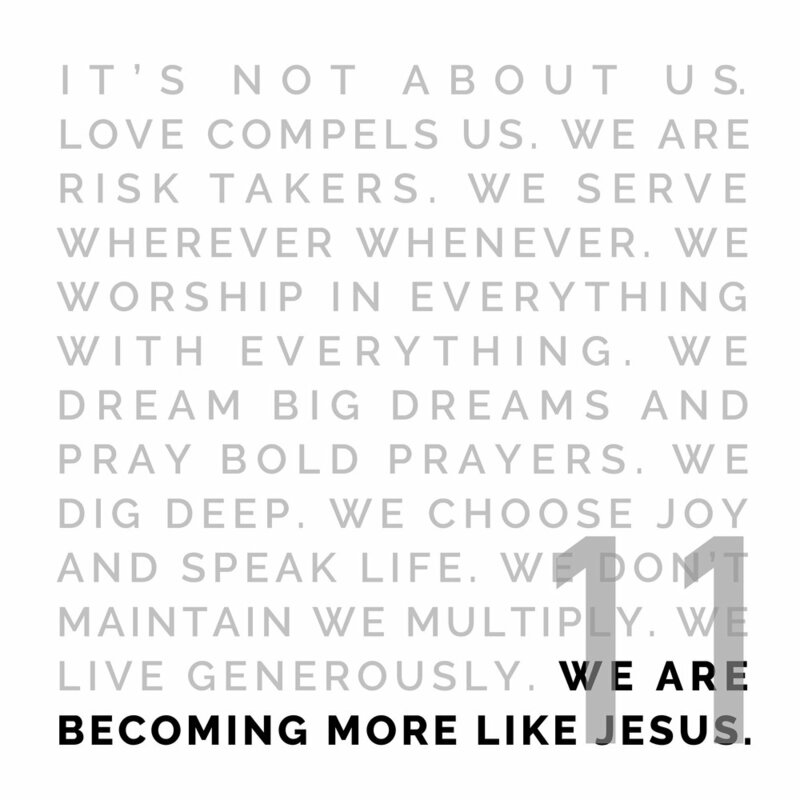 Mission is our DNA, serving is our privilege, and Jesus is our model. We don’t lead with a title, we serve with a towel. We want to be the church, to be the hands of feet of Jesus to every person, everywhere. Our life is a response to what’s been done for us. Through our songs, our work, our daily lives, we offer up thanksgiving. Worship transforms our focus from our gain to His glory. It refocuses and renews our hearts, and it causes us to praise Him in advance for what He’s already promised. If your dream doesn’t scare you, it’s too small. We believe in dreams that start in the heart of God and require God to move. We pray it to pass with boldness. We believe that prayer moves mountains, shifts the atmosphere, and releases God’s purposes on the earth. When you’re digging, you hit various kinds of soil. Sometimes you have to go through the hard stuff to get to the good stuff. We believe every person is necessary, and every part is important. The church should be the birthplace of loving, deep, relationships. We can laugh beyond our circumstances and choose joy in all things, because our eternity is secure. Life is ours because He defeated death. We speak life in every situation, every circumstance, because the battle has already been won. It’s about ongoing growth. Every number represents a life that God has changed. We believe God has called us to reach as many people as we can in our cities and around the world with the Gospel of Jesus Christ. Jesus gave everything to us. This results in generous living and generous giving. We don’t give because we ‘have to’, we give because we ‘get it’. We give because it makes a difference. We give for those who are to come. We give because of what’s been given to us. We are becoming more like Him, walking with Him, growing, changing, every day. Every moment. This is a dynamic relationship. As the word transforms us & the Holy Spirit empowers us, we desire to be more like Him—to be His hands and feet, to every person, everywhere.